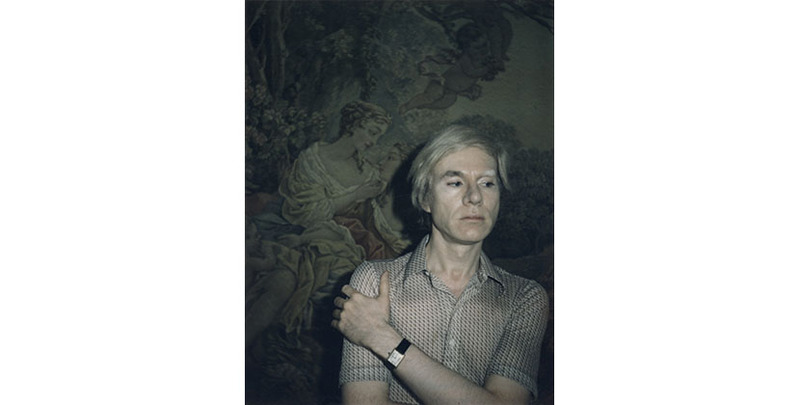 Photo © The Andy Warhol Foundation for the Visual Arts, Inc. 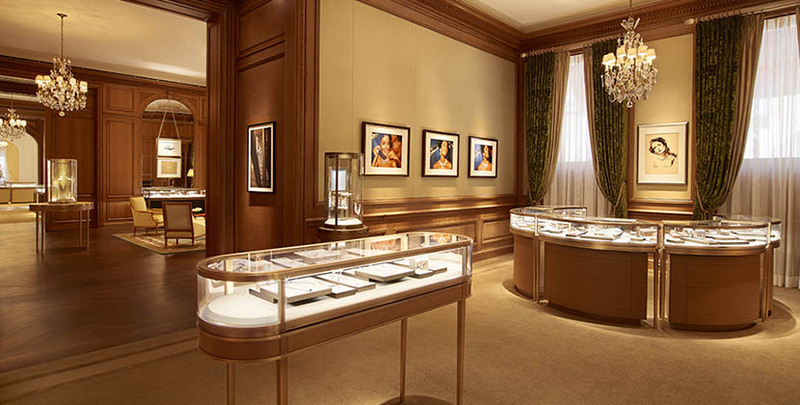 The Adventurine is celebrating the historic renovation and grand reopening of the Fifth Avenue Mansion with a series of stories about Cartier New York. *See photos above by clicking on the > on the right side in the center of the image. “One of the finest and newest of the expensive residences” is how The New York Times described the mansion on Fifth Avenue at 52nd Street when the owner, Morton F. Plant, put his property on the market in 1916. This was high praise considering the home was situated among lavish abodes on Millionaire’s Row. It was across the street from two houses that belonged to members of the Vanderbilt family. The legendary residence of the Astors was just a little over ten blocks uptown from the Plants. Completed in 1905, the stately six-story Plant mansion was designed by English architect Robert W. Gibson. The most opulent portion of the building—on the 52nd Street side where the main entrance was originally located—features a decorative balcony and four two-story fluted Doric pilasters topped by a low-pitched pediment. Beveled stones accent the edges of the building. A decorated frieze covers the fifth floor windows. A balustrade lines the roof. 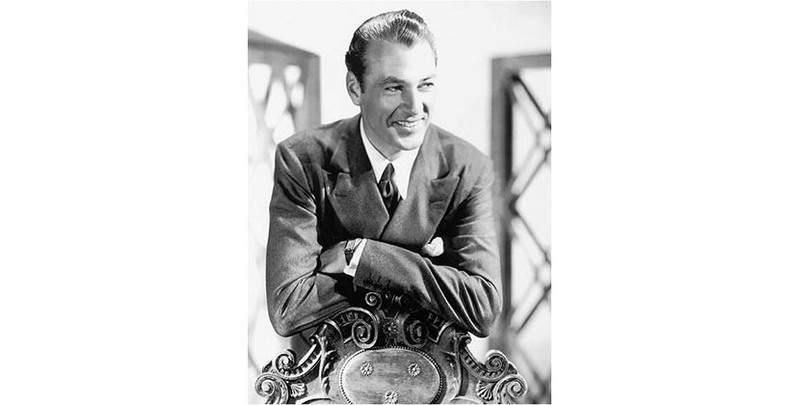 After Pierre Cartier acquired the Plant mansion for a million-dollar pearl necklace, he hired the Rockefeller family’s favorite architect William Welles Bosworth to transform it into the House of Cartier. The first two floors of the interior were turned into retail environments that maintained the spirit of a private residence with wood paneling, chandeliers and fireplaces. Office spaces and a workshop filled the rest of the floors. Only a few modifications were made to the exterior. The main entrance was moved from 52nd Street to Fifth Avenue where there was significantly more foot traffic. Regal display windows with green marble details and awnings were added to the new façade. 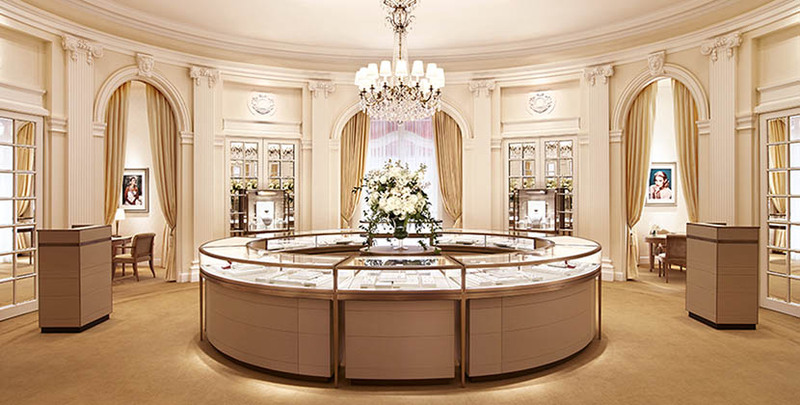 As soon as the renovation was completed in 1917, Cartier won a gold medal for the work from the Committee of Architecture Harmony of Fifth Avenue Association. 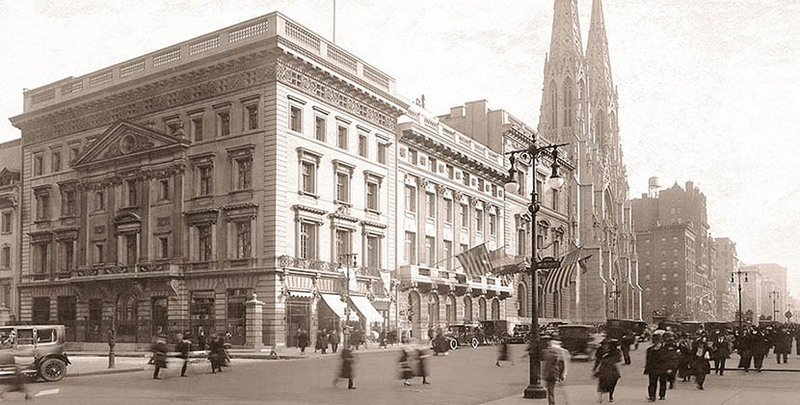 Over the decades, as the residences surrounding the Mansion disappeared and were replaced with office buildings and modern shops, the Cartier façade stayed basically the same. In 1970 after historical buildings, such as Penn Station and the old Metropolitan Opera House, had been leveled all over New York City, Cartier took extreme measures to make sure the Mansion would continue to look as Pierre Cartier had envisioned the building. It became among the first retail establishments to join cultural institutions such as the New York Public Library and Grand Central Station to seek landmark status from the New York City Landmark Association that was established in 1965 to preserve significant buildings from the wrecking ball or major exterior alterations. In his testimony to the committee in 1970, the president of Cartier, Michael Thomas, explained, “The well balanced combination of Italian Renaissance influence with English Georgian undertones is a subtle reminder in this era of glass and bronze, of the heritage of luxurious mansions often overlooked on Fifth Avenue today. At Cartier we feel the ambiance and elegance built into every corner of this townhouse reflect the integrity and stability we stand for. 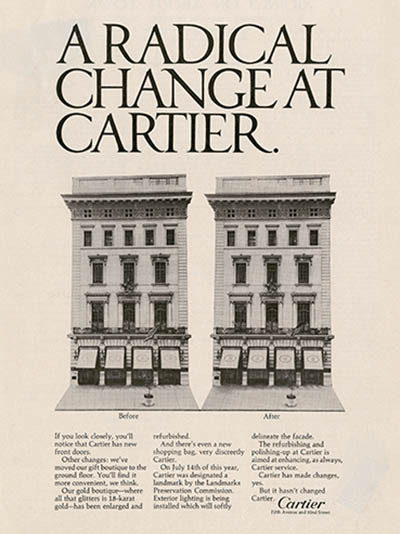 In summation the Cartier store has been and will continue to be a unique example of dignified commercial use without significant exterior alteration, of a fine building originally constructed for residential purposes and located in the prime midtown area.” When Cartier won landmark status from the commission, it made the announcement with a playful advertisement touting the “radical” change with two of the same images of the mansion side-by-side. The stately building has been taken back to the original feeling of a home on the interior more than ever before with the 2016 completion of the two and half year gut renovation executed by lead designer Thierry Despont, who was also responsible for the renovation of The Ritz in Paris. 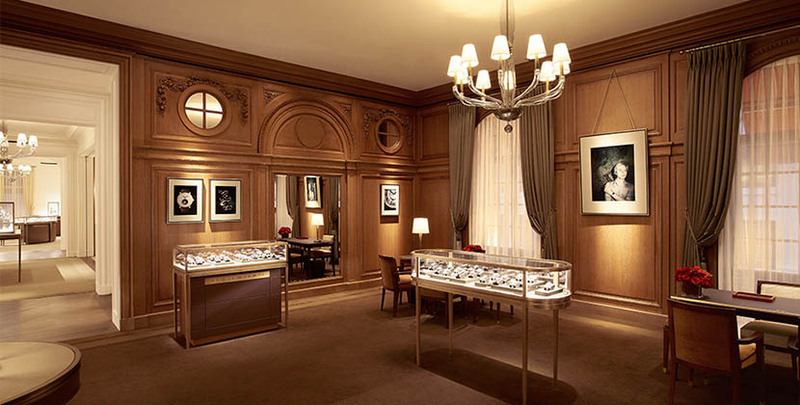 Almost the entire mansion has been transformed into retail space making it the largest Cartier boutique in the world. The new interior’s dazzling mix of antiques, custom made furnishing and elements of hand craftsmanship have rarely, if ever, been seen in a retail environment. Original carved oak panels that lined the walls of the rooms on the main floor were taken out refurbished and embellished with supplements to accommodate the expansion. Several of the original antique chandeliers were preserved and reinstalled in the building and more were acquired to light up new rooms. The original home entrance on 52nd Street has been made into a new foyer named Panthère Hall. 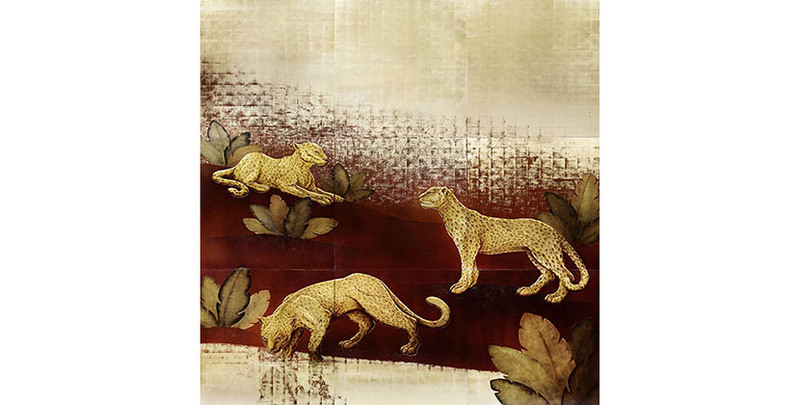 Visitors are greeted there by a large lacquer panel of panthers—Cartier’s unofficial mascot—created by Atelier Midavaine in Paris. 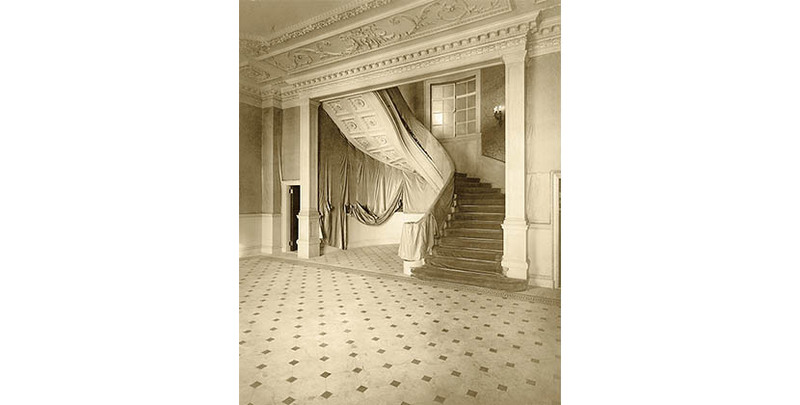 There is also a grand staircase similar in spirit to one in the original home. 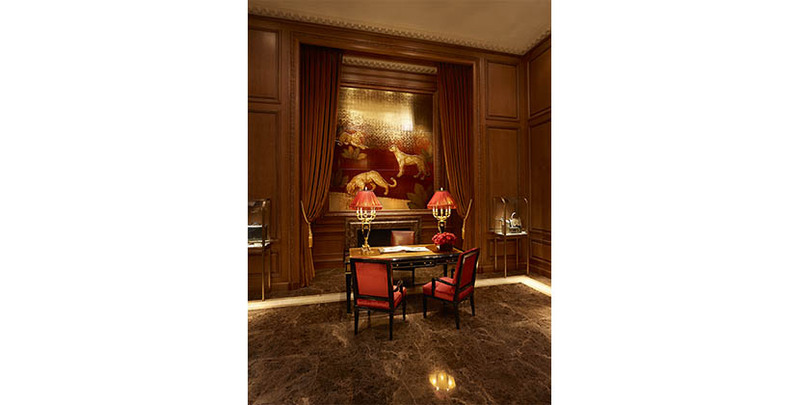 The décor of several rooms throughout the Mansion are inspired by important figures in Cartier’s history. There is a Pierre Cartier library. A chic space on the mezzanine is devoted to Cartier’s legendary creative director Jeanne Toussaint. 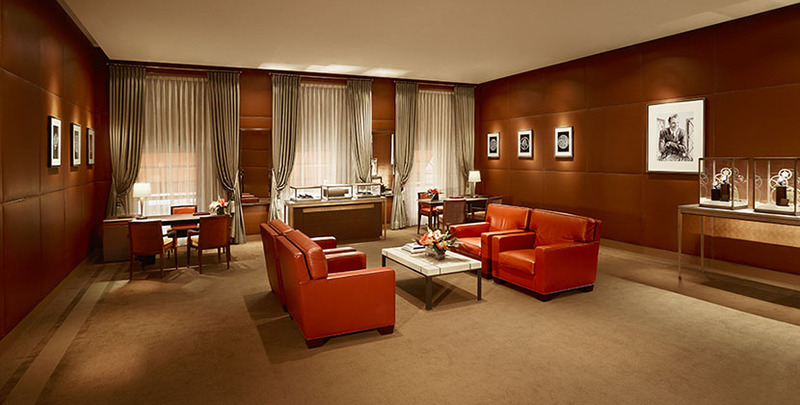 Other rooms are dedicated to celebrated American Cartier clients. 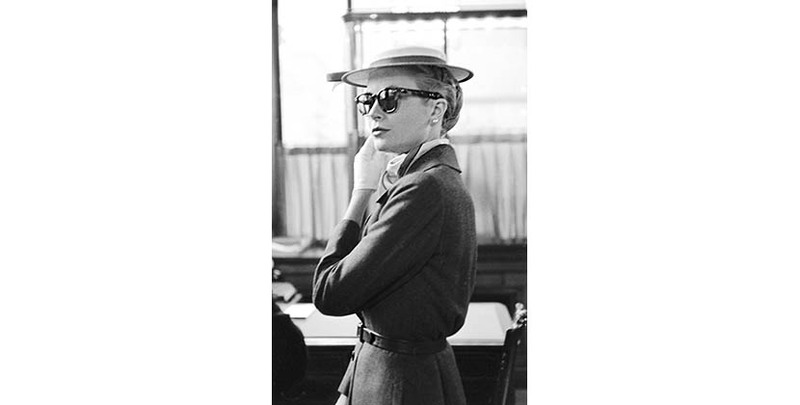 A glamorous oval room on the second floor overlooking Fifth Avenue is devoted to Grace Kelly. 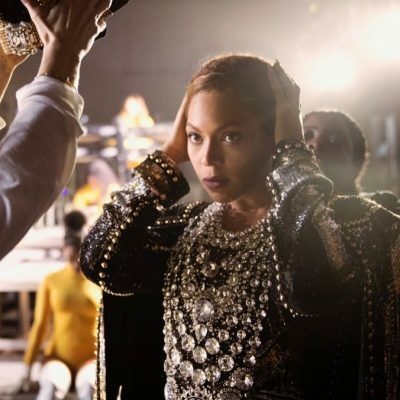 It features a pale color scheme and photos of the princess who had a Cartier engagement ring and maintained a life-long relationship with the jeweler. 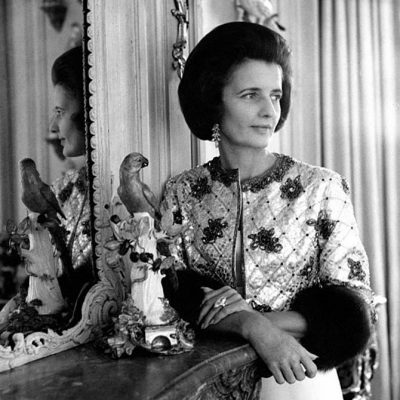 Elizabeth Taylor’s connection to the mansion is celebrated in another gorgeous space on the same floor with photos of the actress in her favorite pieces. The original drawing for Taylor’s famous Peregrina Pearl necklace, executed by Cartier New York designer Alfred Durante, is framed in the room. The oak wood paneled men’s watch room on the third floor is dedicated to Andy Warhol who once said “I wear a Tank watch because it is the watch to wear.” A photo of silver screen icon Gary Cooper in his Cartier watch inspired the stylish red leather walled room featuring complicated timepieces. 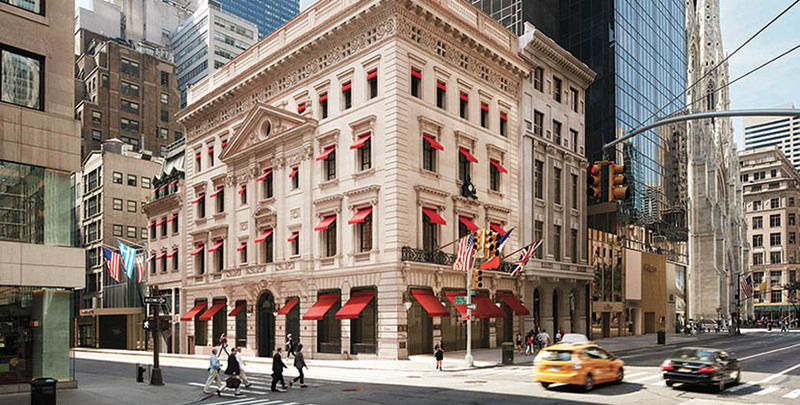 Cartier’s extraordinary renovation of the Mansion on the corner of Fifth Avenue and Fifty-Second Street has not only created a unique shopping experience, it has also preserved an architectural gem from a glorious period of New York City’s history that would be all but gone without it.